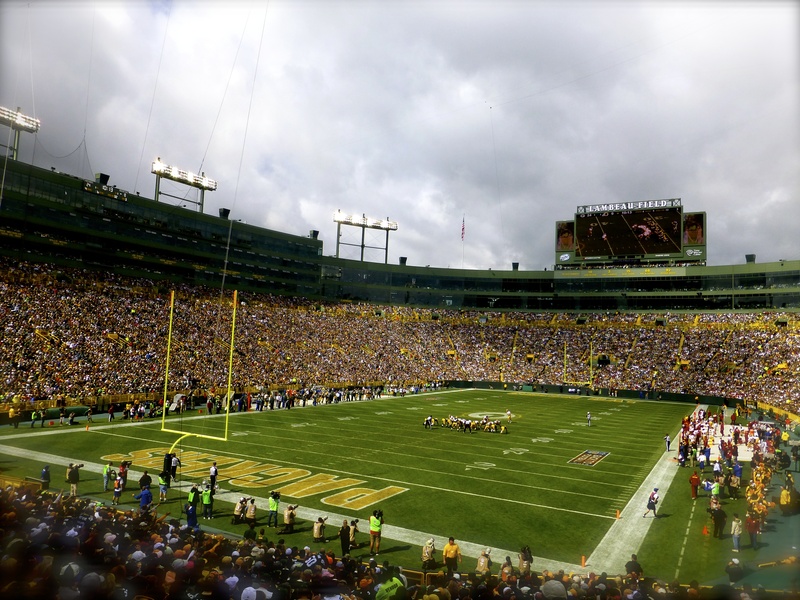 At the top of any NFL fan’s bucket list must be a visit to Lambeau Field. We watched the Packers trounce our division rival Redskins, and it was awesome! September 15, 2013 (Sunday) – We went to asleep around 1 am last night and the alarm rang at 5:45 am. Though we had put Kenny’s signature dry rub on the wings last night, preparations still had to be made, the game started at noon local time, it is a three hour drive, and we could not be rushed through our tailgating. My dad’s old Subaru Outback was passed on to Kenny to take to business school, and we added a little to its 153k miles. It poured rain for much of the drive. The parking lot at Lambeau is perennially sold out to season ticket holders, but the theory of supply and demand proved true yet again. Commercial lots and homeowners all around the stadium sell parking spots in their driveways and on their lawns. Oneida Street is the main drag, we parked in someone’s back yard on Stadium Drive and it seems $20 is the going rate near the stadium. Our host even had a Porta-Potty on his front lawn. 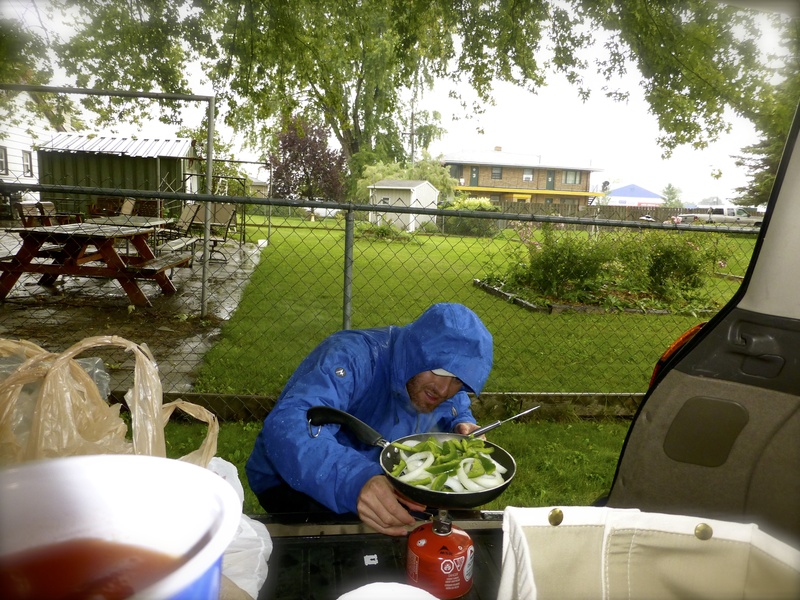 The hatchback provided workspace and some shelter from the rain. Kenny worked up the Bloody Marys while I cut some onions and peppers that we had bought yesterday at the Madison farmer’s market along with the brats. We sautéed the veggies in butter on our backpacking stove. A friendly family parked across the lawn had a more comprehensive set up and invited us under their shelter. Barry, Zach, Lauren and Lee stepped up for us, and further supported my belief that Wisconsinites are friendly folk. They chaperoned our three tailgater brats on their stand up grill and we ate those with pretzel buns and German mustard, both from Whole Foods. Delicious. The wings we had were actually all drumettes which we cooked on our portable Weber propane grill while we heated the Frank’s hot sauce and butter in our pan on their grill. We tossed the wings in the sauce and ate them with a thick, high quality blue cheese and they were outstanding. A nibble of brownie for dessert and we were satiated. After a couple stiff Bloody Marys and some Bud Lights, the rain stopped and we made the three minute walk to Lambeau Field just in time for the first play. Kenny had secured Section 135, row 130, seats 4-6 at $220/each. That is pricey, but it could have been worse for very good seats at the home opener. At this juncture, it was not clear (at least to me) who was driving home. I stood up to buy a round and asked Jenni and Kenny what they wanted. Kenny said “water.” He cracked the door and I plowed through it. 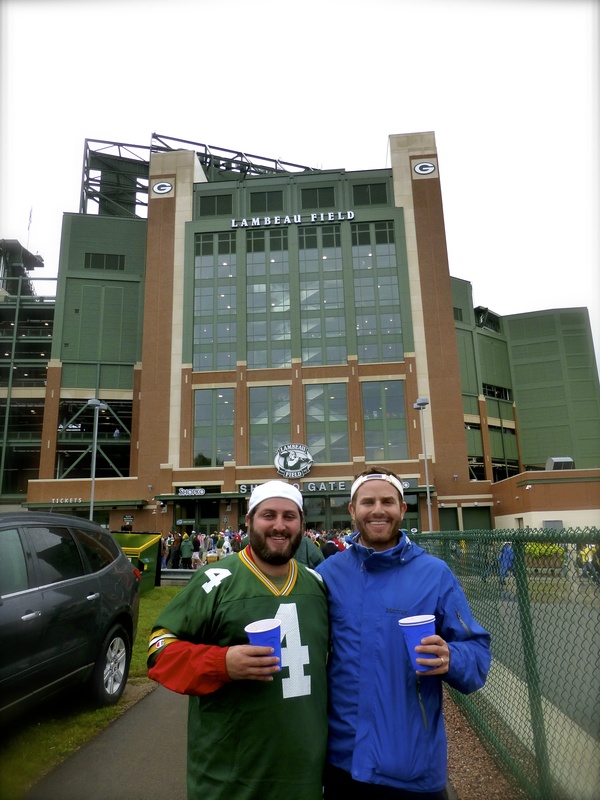 The beers flowed nicely, the game was a crowd-pleaser and we saw at least four Lambeau Leaps. Kenny sat next to a very large woman and this was amusing. 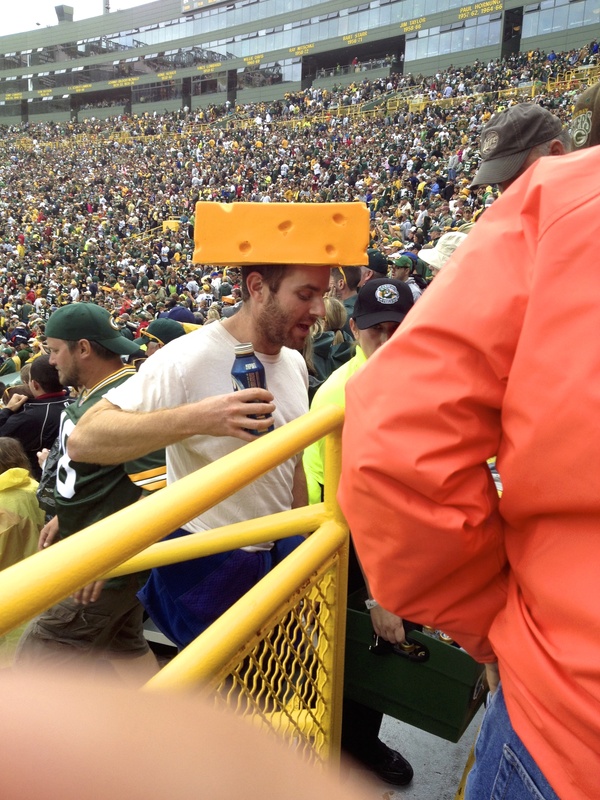 Lambeau is a wonderful stadium with classy fans. They clapped always when an injured opponent stood up. 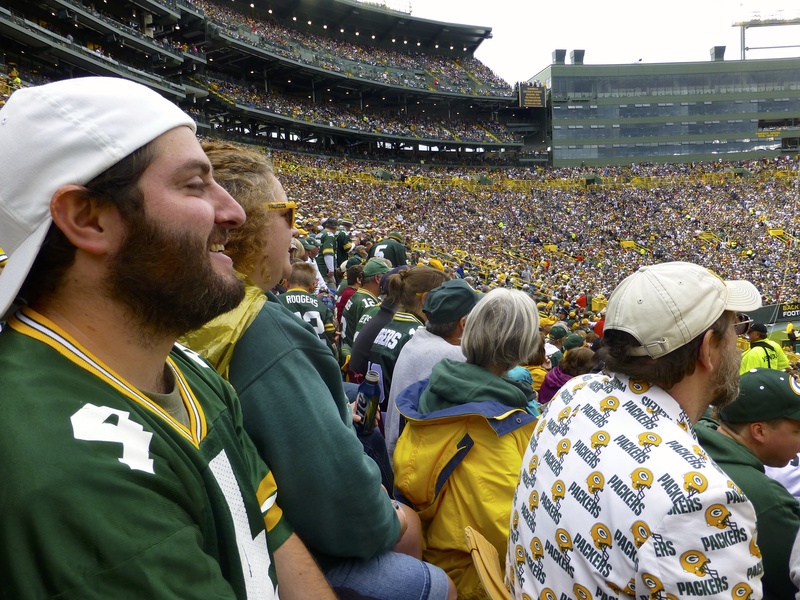 I think if I had to wear the opposing team’s jersey to any stadium, it might be Lambeau. I think that many fans equally relish the game itself and the opportunity it offers for debauchery, and I submit that many favor the latter. But here one senses that football is religion. These fans are not at Lambeau to get hammered, they are there to worship at the temple of football. Here I must give major proppers to Jenni. 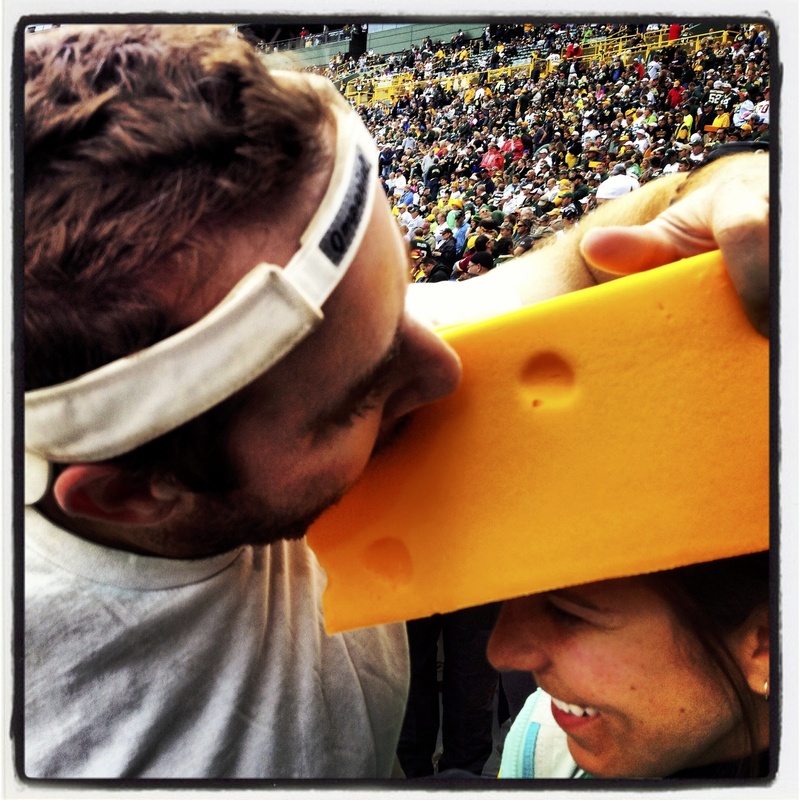 She was adamant about getting a cheesehead at the game, going so far as to demand it. 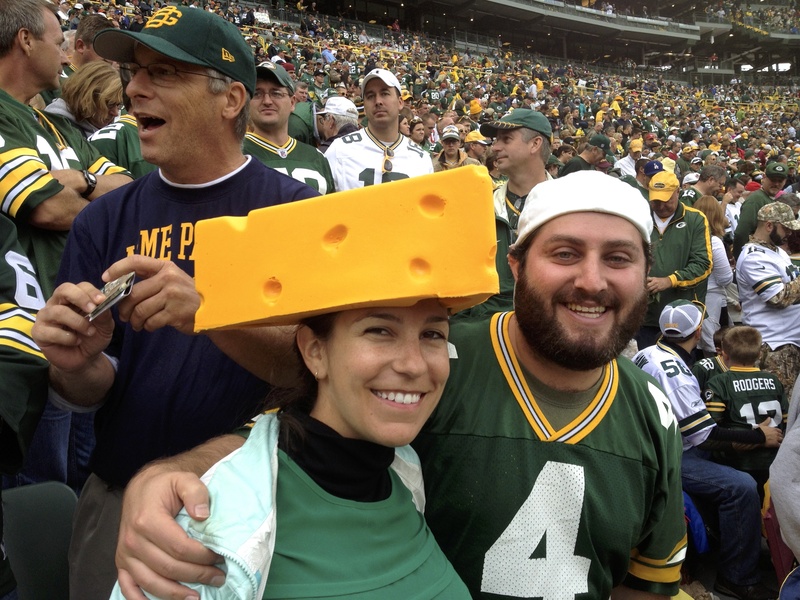 When you spend $440 on two tickets to a football game and instead of asking for shoes or a handbag your wife asks for a $20 cheesehead…well, you have a cool wife. As the game went on, the sun emerged and all were happy. Well, I was ecstatic and I think my companions had a good time when they were not babysitting. When we returned to the car we again fired up the stove and grill and made bacon jalapeño brats with more onions and peppers. If there ever were a time that I would knock over sautéing onions and peppers leading to an open flame in the back of a wagon, today would probably have been it. Theoretically. Kenny stepped up big and drove both ways, and I got to check off a great item on the bucket list. This entry was posted in North America, Uncategorized, Wisconsin and tagged Green Bay, Lambeau, Packers, Wisconsin on November 13, 2013 by aleavitt77. September 14, 2013 (Saturday, cont’d) – Wisconsin is sparsely populated for a while east of Madison. Jenni’s close friend Emily grew up in Milwaukee and it is on the way to Chicago so we decided to spend a few hours there seeing her childhood home and getting a wonderful tour from Emily’s gracious mother. They live in the Story Hill neighborhood right next to Miller Park, and the area reminded me some of where my mom’s parents lived in Queens. There is undeniable evidence of urban decay in Milwaukee as the manufacturing base eroded, but overall it was nicer than I expected with some very impressive architecture. 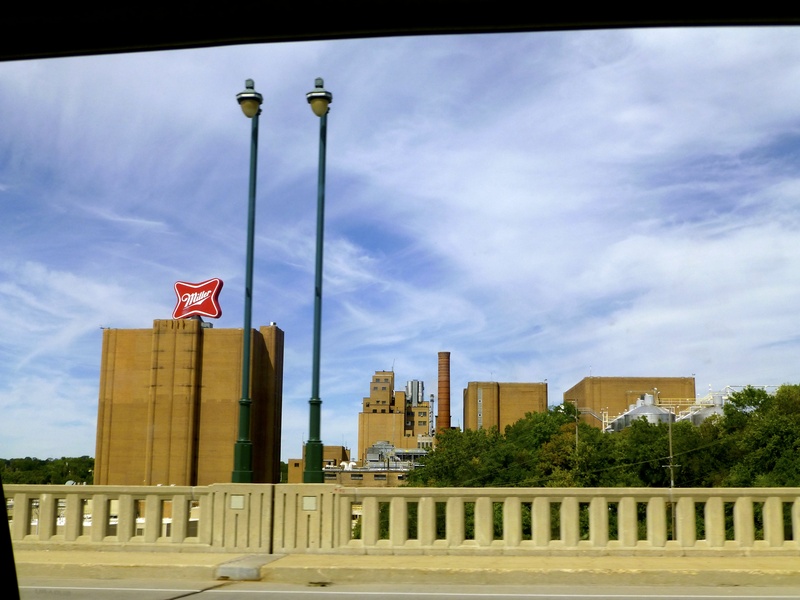 We passed the Miller building, a big Harley plant, and the old Pabst brewery before parking near the county courthouse. This building would hold its own in Washington D.C. or St. Petersburg. In front is MacArthur Square and there is a statue of General Douglas. I learned that his father was also a General and his grandfather was a judge, and all were Milwaukee residents. We crossed the Milwaukee River which has a river walk and saw the Northern Trust bank building, the Marshall building and some nice churches. I think Northwestern Mutual is based here, too. The Milwaukee Art Museum is on Lake Michigan and has an addition designed by Santiago Calatrava. We parked at McKinley Marina on the lake where there is a kite store, bike and skate rentals etc. There is a huge park here and I am told a very big summer festival each year. Between the lake and the road is a smaller body of water where people rented paddle boats and there are weeping willow trees. Discovery World and Reiman Aquarium are also here. I think in the summer time they do fish fry and films here. We continued north along the lake and passed villa terrace and then a beach area with live music and a volleyball tournament. There are lovely mansions on Lake Drive and the homes were old and beautiful with ample property as we drove through the village of Shorewood and then Whitefish Bay, with its quaint, several block downtown. Jenni had been schooled by Emily for years in the ways of Kopp’s frozen custard, so we knew a visit was mandatory. It has an amazing greasy burger smell but we stuck with custard. It was packed but we only waited about five minutes in the custard line. I think each day they have vanilla and chocolate and two special flavors, which are listed for today as well as on a two-day flavor forecast. One of the special flavors was Reese’s but we opted instead for Bienenstichkuchen. Ah, the old childhood favorite of Bienenstichkuchen, naturally. Milwaukee also has a city bike service. 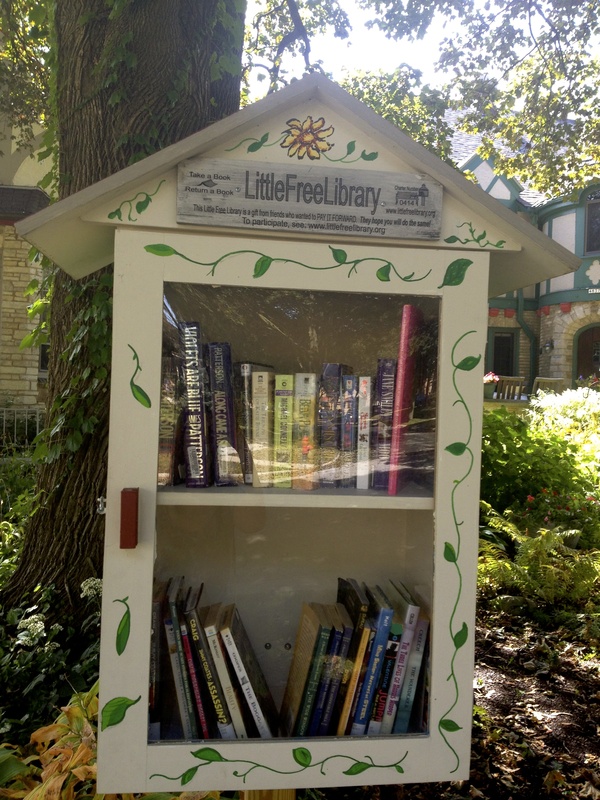 Emily’s mom taught us about Little Free Library which is a great concept that hopefully is rapidly spreading. Check it out. This entry was posted in North America, Uncategorized, Wisconsin and tagged frozen custard, Kopp's, Milwaukee, Wisconsin on November 12, 2013 by aleavitt77. September 12, 2013 (Thursday, cont’d) – We crossed the Mississippi River and immediately I felt closer to home. To avoid any confusion, I use home to describe both my upbringing in the Northeast as well as Los Angeles. I am not sure if it was the symbolic value of crossing the river or entering a state where many I know attended university, or some combination, but I felt it. Perhaps it was the sign for Dunkin Donuts. Clearly this was Wisconsin and not the Northeast as instead of promising food and restrooms the Shell billboard advertised cheese and beer. I did not realize a ski mountain was nearby until we saw a sign for Cascade Mountain. Approaching from the north, I noticed Ella’s Deli before we took a detour to the hipster part of town. At the corner of Winnebago and Atwood were a few spots. There are several more south on Williamson Street. Lao Laan-Xang gets good reviews but would not serve us just before 9:30 pm as they were closing. Our consolation prize was an excellent meal at the highly regarded gastropub A Pig in a Fur Coat. The waiter was very friendly if a bit wet behind the ears. It was cute when he guessed we had not heard of burrata and explained it to us. We ordered that with heirloom tomatoes, rabbit rillettes with pistachio and pickled cherries in honey, and pappardelle with oxtail, mushrooms and parmigiano reggiano. A robust offering of beer and wine by the glass rounds it out. We stayed in another airbnb place and it was phenomenal. The location was great and we had a spacious en suite room akin to staying at a fancy hotel. Mike and Patricia were very friendly and accommodating. They left chocolate by the bedside and a bottle of Rosenblum cellars zinfandel. Cereal, yogurt, fruit, freshly brewed coffee, etc. were available for breakfast. We enjoyed our conversations with Mike who grew up in Chicago and explained that to Wisconsin natives he is one of the FIBs, a/k/a Fu#*ing Illinois Bastards. Capitalizing on the nickname, there is a food cart on the Square serving Chicago dogs and whatnot called Fine Italian Beef and Sausage. Anyway, there is more info available at the airbnb link above, but I cannot recommend this place highly enough and at $95 it is a steal. 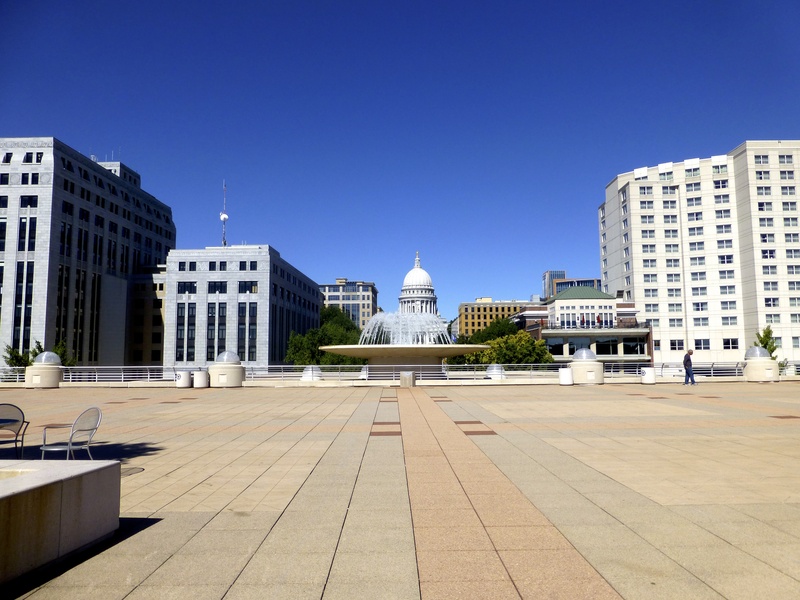 September 13, 2013 (Friday) – Armed with recommendations from my friend Dani and now Mike and Patricia, we walked up to Capitol Square and soaked in the views from Monona Terrace. Frank Lloyd Wright, a Wisconsin native who spent many years in Madison, designed the terrace and first proposed in 1938. Met with resistance for years, it was finally approved and constructed in the 1990s, long after Wright’s death. Never mind that Jenni was incensed at the lack of symmetry between the path to the terrace and the State Capitol. A quick orientation to Madison is that there are two larger lakes separated by an isthmus. In the center of the isthmus is Capitol Square and more upscale/business dining and drinking establishments. On the eastern side of the isthmus is Williamson Street, with more hipsters. At the southwest edge of the isthmus begins the University of Wisconsin campus. 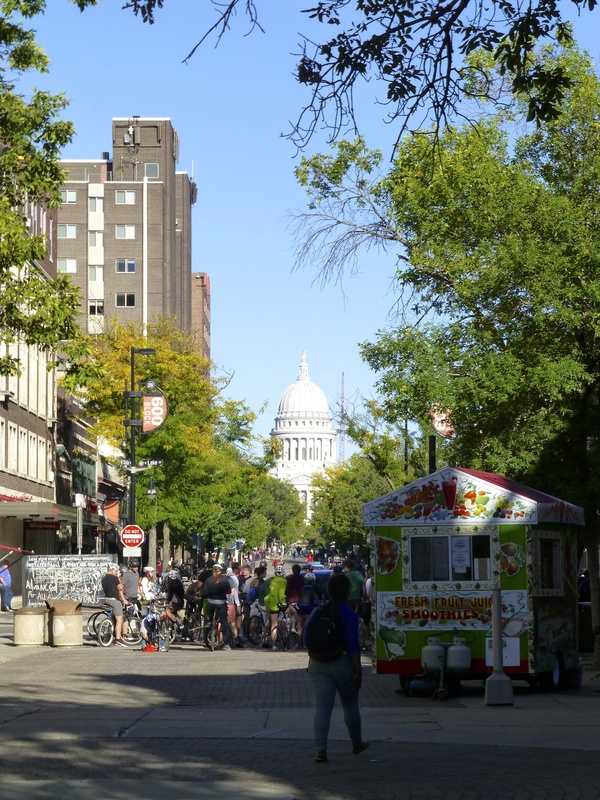 The campus and Capitol Square are connected by the pedestrian only State Street, which is lined with bars, restaurants and shops…mostly independent but with a couple chains represented. Some places on the Square we heard are good include Coopers, Old Fashioned, Brocach and L’Etoile (ranked #14 restaurant in the country some years back by Gourmet or Bon Appetit, I can’t recall). 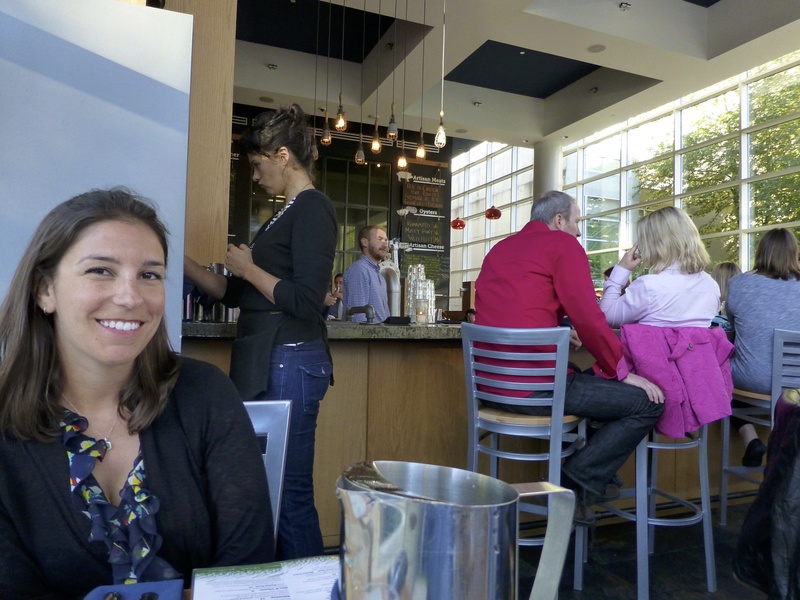 We had dinner at Graze, by the same owner and in the same building as L’Etoile, but more on that later. The “Good Food” cart looked popular. On the Square we saw a little circular garden with a sign from Great Dane Pub & Brewing saying they will soon make a pepper pilsner with the peppers growing here. On another corner was a group of protesters against Governor Scott Walker and his anti-union policies. 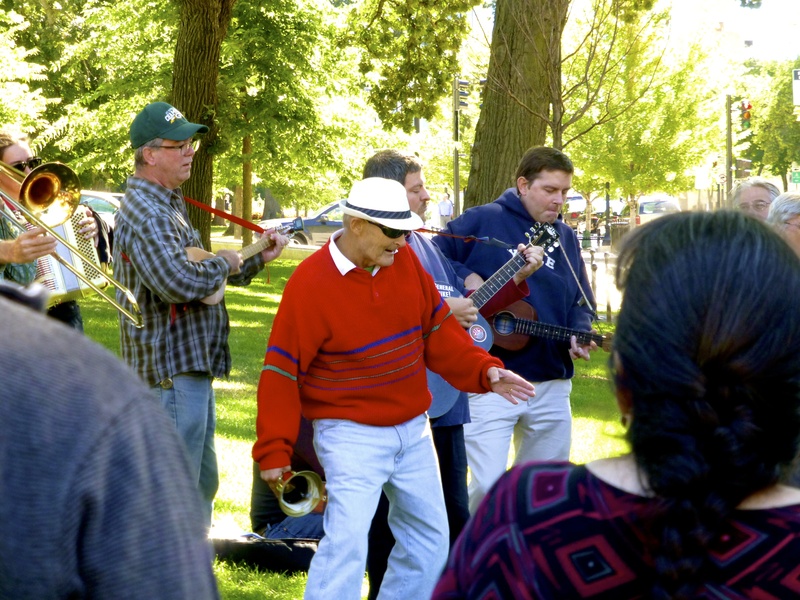 There were perhaps 50 people in a circle with drums, trombones, guitars and tambourines and they had song books with original songs that folks actually knew. Politics aside, it was enjoyable to observe. We bought a cleaning pen and flimsy tripod at The Camera Company before strolling down State Street. Kilwins Candy had an impressive selection of chocolates, fudge, ice cream etc. We were met at the edge of campus with a funky DJ set accompanied by live guitar and lots of food carts. 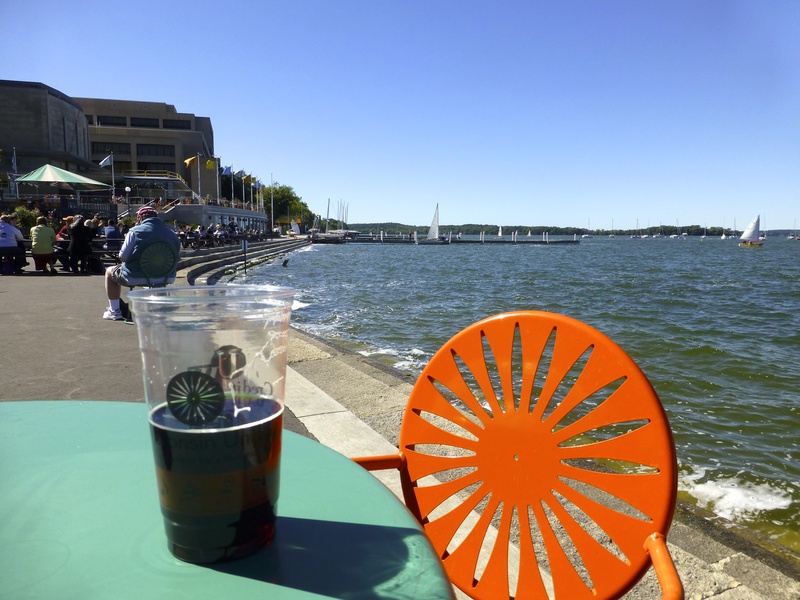 Jenni and I each selected nasi goreng from the Indonesian cart and took our food to a lakeside table at Memorial Union Terrace. I grabbed beers inside at Rathskellar (or really Der Stiftskeller) and we watched the sailboats while listening to sorority girls discuss pressing matters. While I have Tufts pride, I admit we had nothing this cool in Medford. After lunch we walked past the boathouse and through the lovely campus, taking in Bascom Hill and views back to the Capitol before visiting enormous Camp Randall Stadium. From here we walked several blocks on Regent Street which is dingier and I think has a bar scene particularly vibrant on game days. We returned to State Street and walked past incense-burning and head shops up to Graze on the Square. Given the quality of the experience, it is remarkable there was no wait at 6 pm on a Friday. The space has high ceilings, a large U-shaped bar, huge windows, silver colored metal and medium wood tables. The crowd was a mix of friends, couples and families. We started with a small order of cheese curds (these are THE thing in Wisconsin) fried in a vodka batter served with house ranch, which was heavy on the mayo and more like a cross between ranch dressing and aioli. They were bigger than I expected, some approaching golf-ball size, all delicious. Jenni loved her market tomatoes salad with fried squash blossoms, fresh mozzarella, Thai basil and gochujang mayo. I chose the $21 Graze burger. This beauty has fresh ground bacon, sirloin, ribeye and short ribs, caramelized onions, Worcestershire-cabernet jus, Swiss Emmental compound butter and garlic aioli served on a SarVecchio sesame brioche bun with housemade fries. The fries were solid but ordinary, the burger was exceptional. I have eaten a lot of burgers and they rarely live up to the hype, this one did and then some. It has an intense beef flavor, rich taste and perfect consistency. Described as a fork and knife burger, though I found 10 digits sufficient. This is probably one of the top 3 or 5 burgers I have ever had. As a point of comparison, I have had the burger at db bistro moderne (in NY) on more than one occasion. Despite an ingredient list that includes sirloin, braised short ribs, foie gras and black truffle, I found it lacking. The texture was off. Maybe because it is a stuffed burger rather than being all ground together. Why did I order it more than once if I was not enamored, you ask? Stop asking silly questions. Returning to Graze… there is a great selection of beers on tap. Jenni got the Spotted Cow from New Glarus Brewing and I got the Luna Coffee Stout from Hinterland. The back of the menu lists all the suppliers and there is a rotating selection of 12 different artisan cheeses. I highly recommend Graze. The service was top-notch, and despite the $21 burger (worth every penny), beers were only $4.50 each and our total bill was $67 with tip. 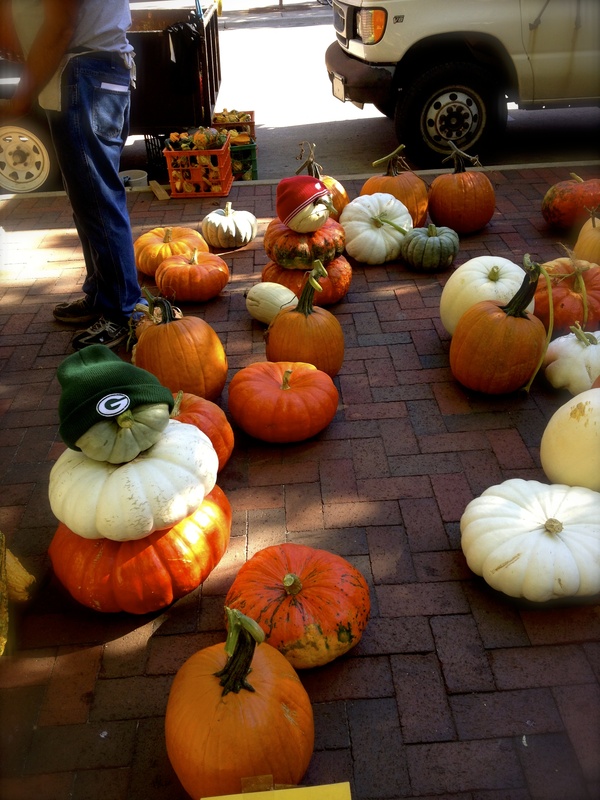 September 14, 2013 (Saturday) – After a banana and some more conversation with our airbnb hosts, we went for a run along the bike path past Monona Terrace to the Red Caboose then circled back to the center of the Square for the Saturday morning farmer’s market. WOW. Stalls line the entire Square and it draws a huge crowd. On offer is every kind of pepper, squash, tomato, potato etc. I had heard of, and many I had not. There were flowers, pastries, venison jerky, beans, carrots, apples, pickled everything, ground cherries, baby rice popcorn which is a tender and hull-less variety of corn…Fresh cheese curds are promised to squeak in your mouth and we grabbed a satchel for $4.50, though kind of wish we had held out for the Farmer John’s stand. At Stella’s we got the famous hot and spicy cheese bread. It is basically challah and not that spicy and needs more cheese. Solid but a touch disappointing given high expectations. 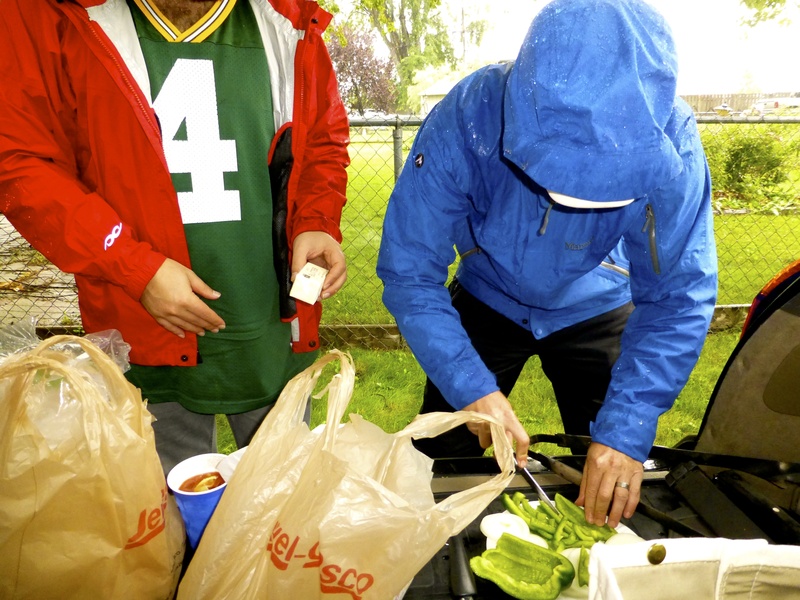 With tickets for tomorrow’s Packers game, we knew we needed some brats for the tailgate. D&G came through with an impressive selection, we opted for a package of the fittingly named tailgater with beer and onion and also a package of bacon jalapeno. Jenni got a date and currant scone from Sugar River Country Bakery, where the guy advised to stick it by the windshield on the drive home to heat it up. We grabbed a delicious bottle of apple cider from Morren Farm. I struck up a conversation with a young lady speaking to one of her older relatives (who had a stall) in a foreign language. I had seen multiple Laotian (some mixed with Thai) restaurants and stall owners who appeared Laotian so I was curious. The young lady told me there is a large Hmong population around Madison. She said that many Hmong supported the US in the Vietnam War and that the US brought them here to protect them from reprisals. As Laos is on our itinerary, I got a recommendation or two before we walked back to the apartment to pack up and hit the road for Milwaukee then Evanston. 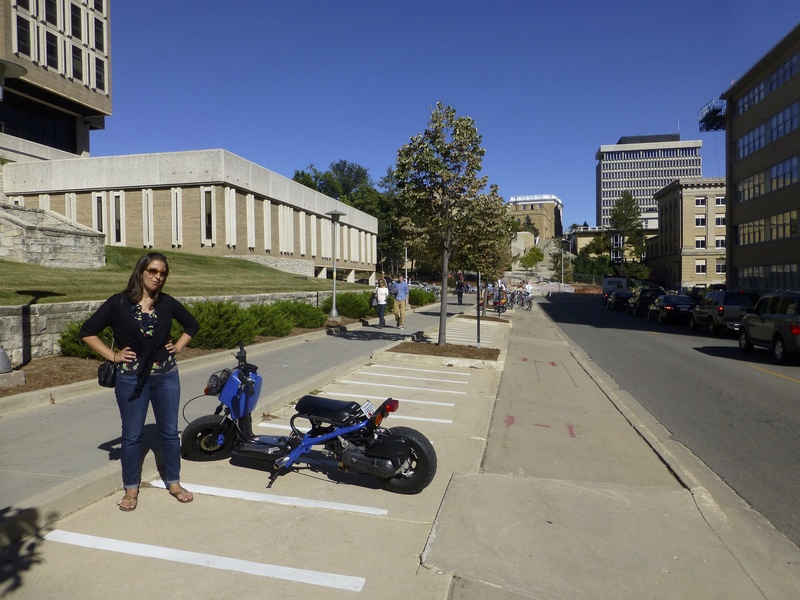 Summary of Madison: I thought I would like Madison a lot, and I was far from disappointed. We had two spectacular, late summer / early fall, sunny, clear, crisp days. It is like a grown up city in a child’s body. The university presence is large and unavoidable. It is a well-respected institution with strong athletics. I love the culture of learning, curiosity and tolerance that one often finds in a college town. 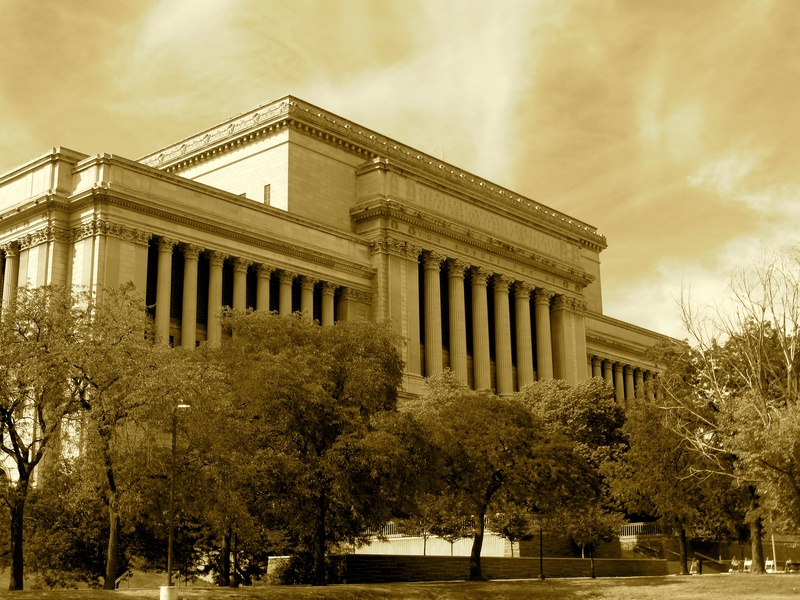 Concerts (check out the Majestic Theatre and the Orpheum Theater) and renowned speakers come through. Politics (and protests) play a big role since it is the state capitol. Outdoor activities abound with bike trails (and a city bike service), kayak rental on the lakes, nearby small mountains, etc. 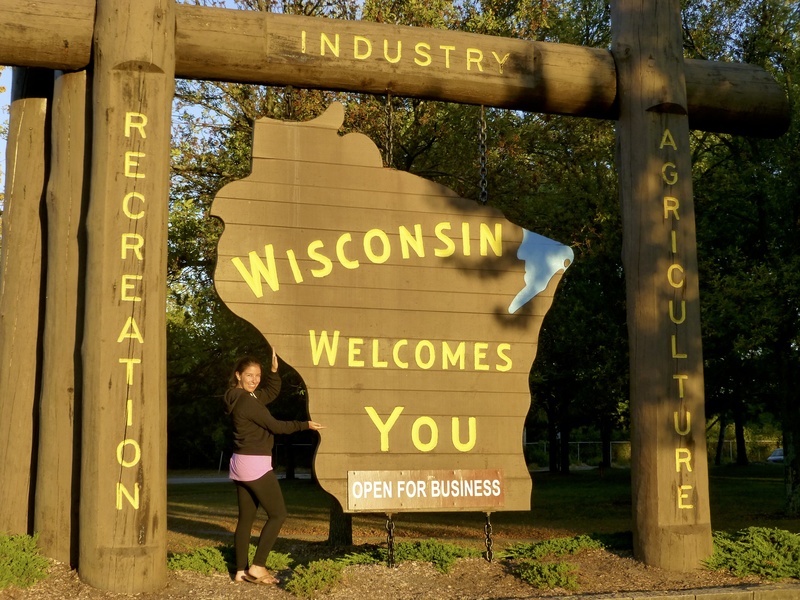 Madison is health conscious yet the foodie culture is prevalent, with terrific local produce, a strong brewing tradition and more. There is a hipster area. The city is very walkable. It is liberal but not in that echo chamber, obnoxious, in-your-face kind of way. It occurred to me that on paper, Madison has a lot in common with Austin, Texas. They are both fairly liberal cities in more conservative states, the seat of the state government along with the state’s major university (and each is prominent academically and athletically), smaller than other cities in their states, on lakes with an active outdoors culture, etc. Special thanks to Dani and Elyssa for their great recommendations. 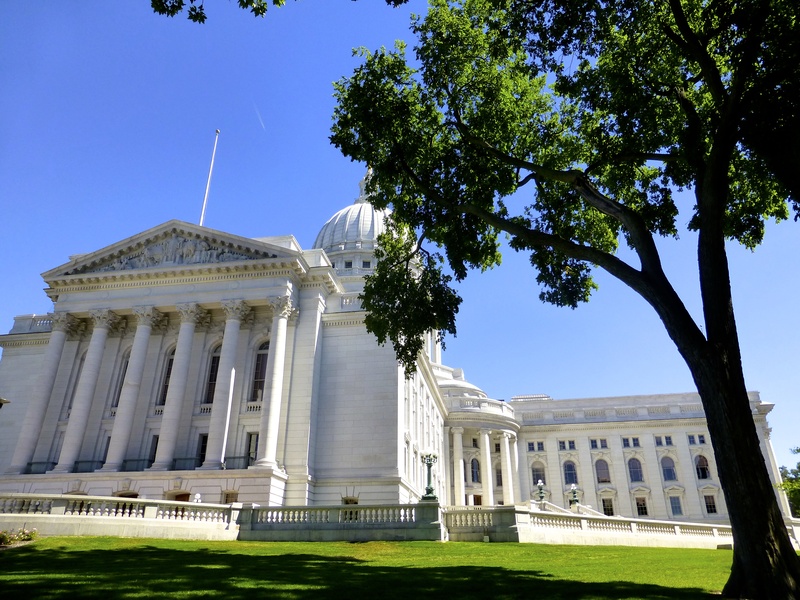 I will pass along some of what they said in unedited form below as it might help if you plan to visit Madison…which you should definitely do, likely between May and September! “sardine also new, and by the capitol but haven’t been. Also up by capitol, but old school: the great dane (brew pub), jenna’s (bar), jolly bob’s (carribbean restaurant). Coffee: espresso royale/ancora coffee/cafe michaelangelo. brewery tour if you’re interested, also essen haus (beer hall). By stadium: mickey’s dairy bar (breakfast), dotty’s dumplings. Nitty gritty for burgers (closer to kohl center I think). This entry was posted in North America, Uncategorized, Wisconsin and tagged Badgers, Graze, Madison, Wisconsin on November 12, 2013 by aleavitt77.